Let's all cast our minds back to 990 years in the future. January, 2000: The “Widening Rifts” storyline concludes, and as it does so, the series Legion of Super-Heroes Volume 4 and Legionnaires come to an end after 125 and 81 issues, respectively. January, 2000: First issue of the miniseries Titans/Legion of Super-Heroes: Universe Ablaze. 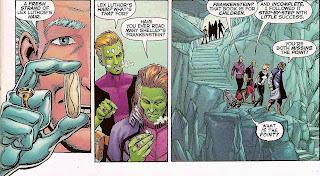 March 1, 2000: First issue of the limited series Legion Lost. Introduction of Shikari, one of four new Legionnaires to be created and join the team in this decade. 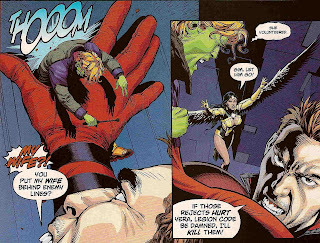 January 3, 2001: Panels from Legion Lost #11 (Abnett-Lanning/Coipel-Lanning). February 21, 2001: First issue of the Elseworlds series Superboy's Legion. 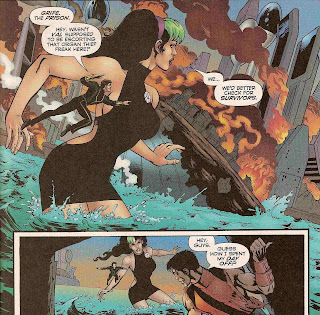 April 18, 2001: First issue of the limited series Legion Worlds. October 24, 2001: First issue of The Legion, the fifth ongoing series to star the Legion of Super-Heroes as title characters. 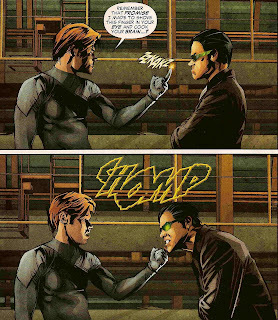 July 24, 2002: Panels from The Legion #10 (Abnett-Lanning/Walker-Andrasofszky-Coipel-Lanning). July 6, 2003: The message boards at www.legionworld.net open for business. November 25, 2003: TwoMorrows publishes The Legion Companion, a collection of interviews with Legion creators from over the years. 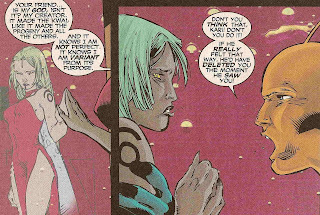 August 11, 2004: Panels from The Legion #37 (Simone/Jurgens-Smith). 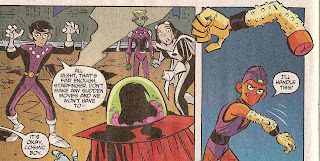 September 29, 2004: With the publication of the Titans/Legion of Super-Heroes Special, the reboot Legion goes into limbo and the threeboot Legion is introduced. November, 2004: TwoMorrows publishes Best of the Legion Outpost, a collection of the best articles from the pivotal APA. December 29, 2004: First issue of Legion of Super-Heroes Volume 5, the sixth ongoing series to star the Legion of Super-Heroes as title characters. February 2, 2005: First-ever blogpost on Legion Abstract. 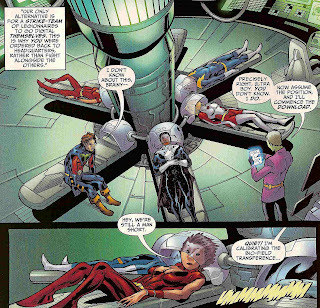 April, 2005: Publication of Chris Roberson's novel Here, There and Everywhere, a time-travel novel containing a cameo appearance by three futuristic teenagers bearing a striking resemblance to Lightning Lad, Cosmic Boy and Saturn Girl. 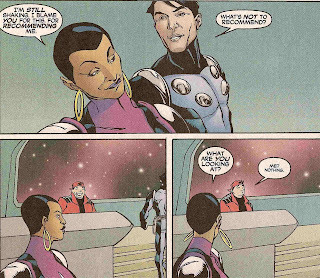 June 22, 2005: Panels from Legion of Super-Heroes #7 (Waid/Kitson-Thibert-Pascoe). November 8, 2005: First-ever blogpost on the Legion Omnicom. December 4, 2005: First-ever blogpost on Get-A-Life Boy's LSH Blog. 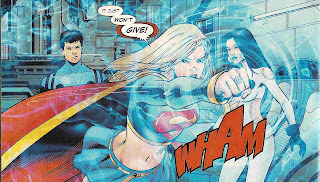 March 22, 2006: With issue #16, the comic book Legion of Super-Heroes is retitled Supergirl and the Legion of Super-Heroes. April 15, 2006: The cartoon series Justice League Unlimited broadcasts its episode “Far From Home,” guest-starring the Legion of Super-Heroes. 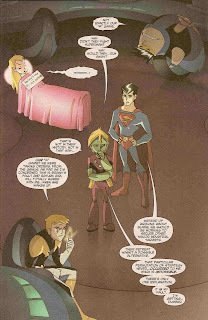 May 25, 2006: Supergirl and the Legion of Super-Heroes #18 introduces Dream Boy, also known as Rol Purtha of Naltor, second of four new Legionnaires to be introduced and to join the team this decade. July 9, 2006: Debut of the Legion Wiki (as far as I can tell). September 23, 2006: First episode of the animated series Legion of Super-Heroes airs on the CW network. December 6, 2006: The last page of Justice Society of America #1 shows a glimpse of Dawnstar's arm, giving us our first hint of the existence of the retroboot Legion. December 27, 2006: Panels from Supergirl and the Legion of Super-Heroes #25 (Waid/Kitson-Gray). 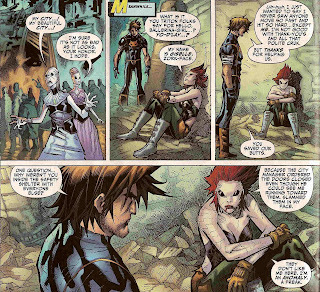 April 4, 2007: First issue of the five-issue story “The Lightning Saga”, a Justice League/Justice Society crossover, in which the retroboot Legion is introduced. April 18, 2007: First issue of the comic-book Legion of Super-Heroes in the 31st Century, a Johnny DC title based on the cartoon and the seventh ongoing series to star the Legion of Super-Heroes as title characters. July 18, 2007: Panels from Legion of Super-Heroes in the 31st Century #4 (Boylan/Uy). August 3, 2007: McDonald's offers figurines of eight characters from the Legion cartoon as Happy Meal toys: Superman, Lightning Lad, Brainiac 5, Timber Wolf, Bouncing Boy, Tharok, Validus, and Mano. August 22, 2007: Panels from Supergirl and the Legion of Super-Heroes #33 (Bedard/Calero). September 22, 2007: First episode of the second season of Legion of Super-Heroes introduces the character Kell-El, also known as Superman-X, third of four new Legionnaires to be introduced and to join the team this decade. October 31, 2007: First issue of the six-part story “Superman and the Legion of Super-Heroes” in Action Comics, in which we first see the retroboot Legion in their native setting. December 26, 2007: Supergirl and the Legion of Super-Heroes reverts to its previous title, Legion of Super-Heroes. The new creative team on the book includes up-and-coming artist Francis Manapul and old-school Legion writer Jim Shooter. 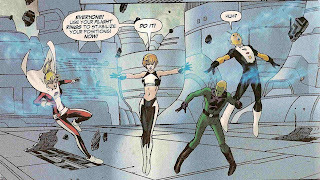 Issue #37 introduces Gazelle, also known as Giselle Smith of Triton, fourth of four new Legionnaires to be introduced and to join the team this decade. January 30, 2008: Panels from Action Comics #861 (Johns/Frank-Sibal). February 27, 2008: Fiftieth anniversary of the Legion of Super-Heroes. February 27, 2008: Panels from Legion of Super-Heroes #39 (Shooter/Manapul-Livesay). May 27, 2008: First Legion podcast from the Super Future Friends. July 9, 2008: Panels from Legion of Super-Heroes in the 31st Century #16 (Manning/McManus). August 20, 2008: First issue of the limited series Final Crisis: Legion of Three Worlds, a crossover featuring the reboot, threeboot and retroboot Legions, with art by George Perez. September 2, 2008: Sequart Books publishes Teenagers from the Future, a book of essays about the Legion. October 7, 2008: The Legion of Substitute Podcasters announces its first podcast. January 15, 2009: Lightning Lad, Saturn Girl, and Cosmic Boy guest-star on an episode of Smallville. January 28, 2009: Panels from final issue of Legion of Super-Heroes volume 5 (Thyme/Bachs-Livesay). April 29, 2009: Panels from Final Crisis: Legion of 3 Worlds #4 (Johns/Perez-Koblish). May 15, 2009: Mattel releases a set of four Legion action figures, including Lightning Lad, Saturn Girl, Cosmic Boy and Brainiac 5. July 22, 2009: Long-awaited fifth and final issue of Final Crisis: Legion of Three Worlds. August 12, 2009: Issue #1 of Adventure Comics volume 2, which would feature the Legion of Super-Heroes in backup stories for a few issues. September 9, 2009: DC Comics announces that Paul Levitz will become the new writer for a regular Legion of Super-Heroes run in Adventure Comics starting sometime in the next decade. October 14, 2009: Panels from Adventure Comics #3 (Johns-Shoemaker/Henry).